I realized after reading some of the comments from last week's post that I might have come off a little cocky comparing myself to Sting. That wasn't my intent (I'd also remind everyone that Sting hasn't always been as good as he was with "Every Breath You Take"--anyone remember that song he did for the utterly forgettable Three Musketeers movie?). Rather I wanted to point out that sometimes whether your writing songs for the masses or a gag for a handful of editors in the Church Office Building, sometimes you just know you've done your job. Thanks, Wendi, I really like this gag a log too. I was surprised when The New Era passed on it. 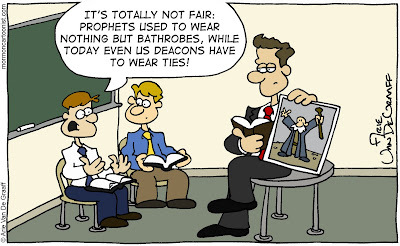 Maybe they disapproved of a Priesthood adviser treating church furniture in that manner. Since you have "Da do do do da da da da" as a label, are you trying to tell us that isn't one of Sting's best songs? The lyrics were so complex though. That's all I have to say to you. I hope Moses is wearing more than "nothing but a bathrobe." If not he needs to keep the front flaps closed up a little better. I don't think your comments were cocky. Sting would never be able to draw such an artistic view of a Sunday School room. I know what you mean...sometimes you know you've hit a home run, sometimes you know you haven't, and sometimes you're left wondering just what went wrong. You may be on to something with that furniture thing! Speaking of home runs, Kevin, I thought your comic in February's New Era was easily the funniest on "The Extra Smile" page. Check it out here and I'm sure the rest of you will agree with me. Oh, and Jena, don't think me unkind, but a song's lyrics aren't the only thing in determining how good it is. After all, words are meaningless and all that's true. That's all I have to say to you. Would love to follow your blog but didn't see a follow op or an RSS feed! And why is long hair taboo when all of Christ's portraits show him a bit hippyish? Isn't it sad when we require and judge people by the neck decorations they choose to wear or not wear? One of the many reasons I quit. Nice cartoon, very true.